The FOHBC is proud to present a variety of fascinating educational seminars at the 2017 Springfield National Bottle Convention and Expo. This distinguished group of presenters was organized by seminar coordinator, Michael George. In the past, because two seminars were presented simultaneously, you were forced to choose one and miss another. We have partially remedied this situation by arranging the videotaping of our seminars which will be made available to all on the FOHBC web site. 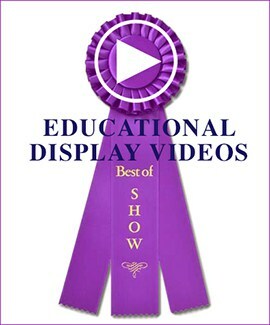 Details concerning obtaining those videos will be announced at the time of the seminar presentations. The seminars will take place on Friday, August 4th, 2017 from 9:00 am to Noon at the MassMutual Center, Meeting Rooms 1 – 3. Listed below are the seminar topics, the presenters and the location where these educational seminars will take place. 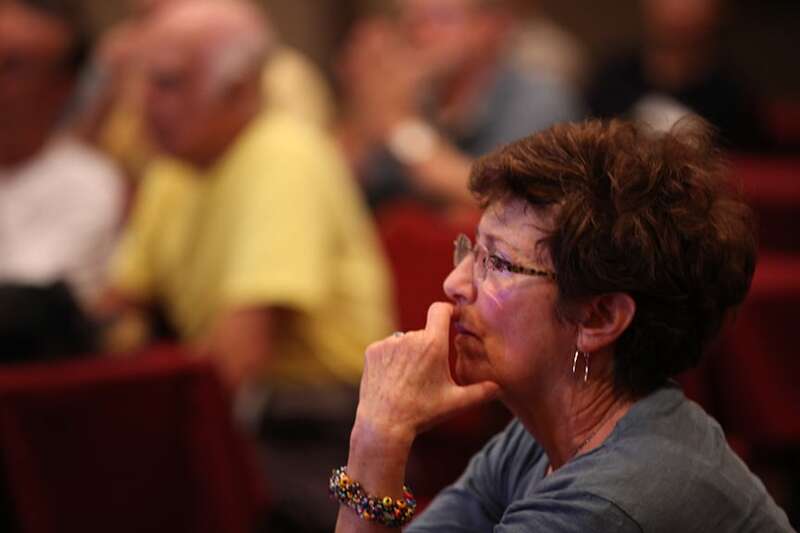 Any questions concerning the FOHBC Educational Seminars can be directed to Michael George at earlyglass@gmail.com or either of the Springfield Co-Chairs, Jim Bender or Bob Strickhart. 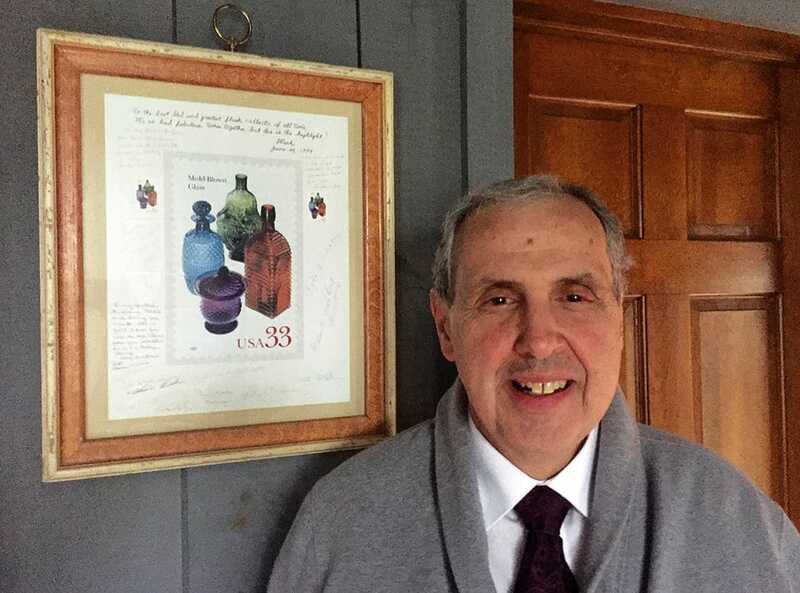 This years Hall of Fame recipient (along with his father Charles), Mark Vuono has been collecting historical flasks and blown three mold flasks for over half a century. Of course when anyone asks what Mark and Charlie Vuono’s biggest accomplishments have been, the number one answer would be that they together built the best-ever collection of American-made historical flasks in the world. Their collection has taken well over a half century to build to what it is today. Mark is also an author of numerous educational articles relating to the fields of collecting historical flasks. His seminar will be geared towards the beginning collector, focusing on the 15 different McKearin groupings of historical flasks and discussing some of the more common examples that are obtainable for the beginning collector. 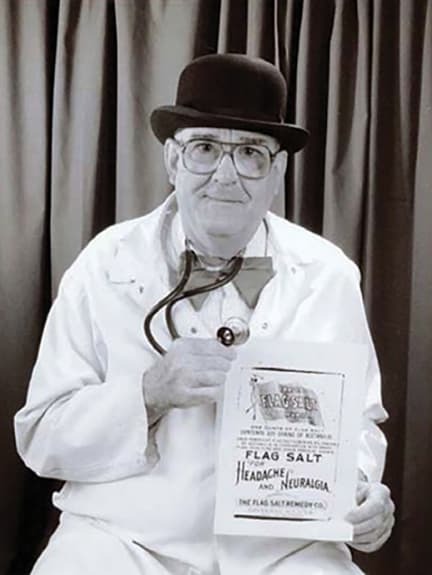 Come join John M. Spellman as he transforms into Dr. William H Sweeting and steps you back through a curtain of time so you can experience his education, practice, house calls, historical events of his day and the discovery of his Flag Salt Remedy. This medicine, which treated headaches, neuralgia, colds, fatigue, and lagrippe will travel around the world from Savannah, New York. John Spellman is the town Historian of Savannah, New York and has written two local history books and several articles on this upstate New York rural community. John has collected glass items produced at the Clyde Glassworks, in Clyde, New York for over 40 years. He has written about and exhibited his collection throughout the northeast. In 1968, he co-produced and narrated a video documentary on the “History of the Clyde Glass Works”. John’s desire is for you to experience the rich history of the patent medicine industry as experienced through Dr. Sweeting and the Flag Salt Remedy. Wes Seemann was born on February 17, 1937 in Portage Wisconsin. After eight years in the Navy and four in college, Wes journeyed to Alaska where his crew found the oil on the North Slope. Wes is a commercial pilot and was a rock hound at age six. Fifty-four years ago, Wes married his wife Diane, his right and left hands. While doing a bottle show in Keene, New Hampshire, Ray Barlow bought several very good pieces of Sandwich glass from Wes and Dianne. From that time on, he was their mentor and longtime friend. Diane and Wes have been collecting glass ever since. Borrowing a line from Wes’s commencement speaker Paul Harvey, “That’s the rest of the story”. 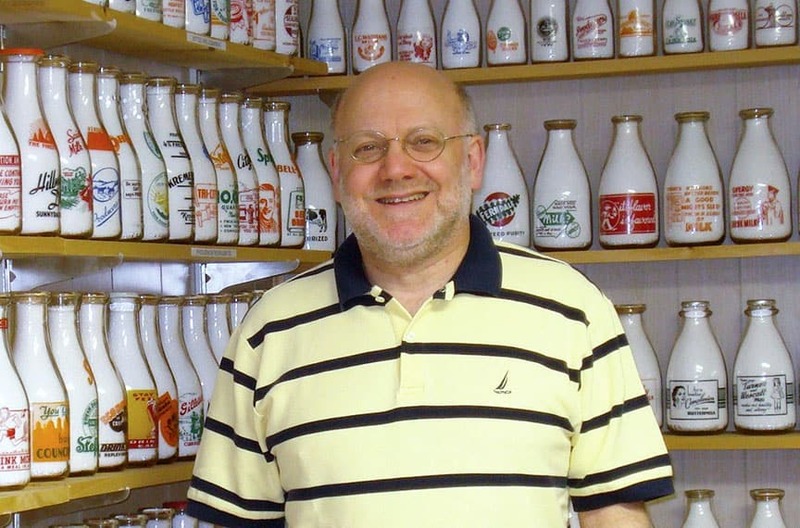 Peter Bleiberg, from New Hartford, New York, is the Editor of The Milk Route, the monthly publication of the National Association of Milk Bottle Collectors. Peter also serves as Treasurer and Bottle Show Chairman of the Mohawk Valley Antique Bottle Club. Peter’s son Paul works in Washington as a lobbyist for the National Milk Producers Federation, although Paul says that growing up in a house filled with milk bottles had nothing to do with his interest in U.S government dairy policy. Peter reports that the only milk consumed in the Bleiberg house is poured over the occasional bowl of Cheerios or Rice Krispies, since he hasn’t had a glass of milk in over forty years. Michael George was born and raised in New Hampshire, and currently resides with his family in the countryside of New Boston. His passion for American glass started at an early age. 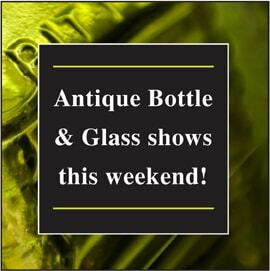 Today, Michael has become an avid collector and premiere antique glass dealer. He has also conducts numerous lectures for historical institutions and his articles have been published in such magazines as Antique Bottle & Glass Collector, Bottles & More, and Antiques & Arts Weekly. In 2012, Michael served as organizer and curator of the 3-month long New Hampshire Glassmakers Exhibit at the Peterborough Historical Society. He is a member of the Federation of Historic Bottle Collectors, member of the Yankee Bottle Club and Merrimack Valley Bottle Club. 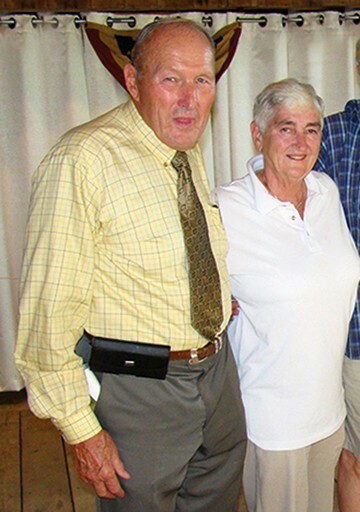 In the summer of 2013, Michael served as Chairman and organizer of the first Federation of Historic Bottle Collectors (fohbc.org) national show in New England. He is also very active in the bottle and glass show circuit, participating in over a dozen events annually throughout the East Coast. 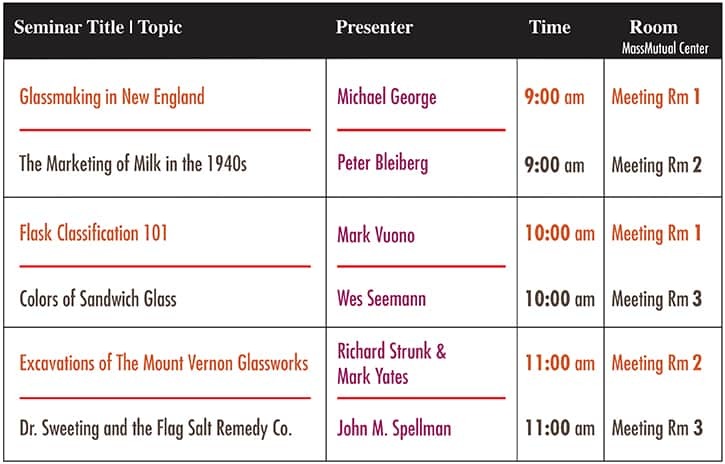 Michael will discuss “The Glassmaking Industry Throughout New England”. As Springfield, Massachusetts is in the heart of this region, we will investigate the factories, and output of these “local” glass manufacturers. Mark Yates, a lifelong Central New York native, resides in Cazenovia, New York with his wife, Linda and his four daughters. He has a degree in Chemistry from Lemoyne College and is an environmental consultant and industrial hygienist. Mark started digging for old bottles on farm dumps near his childhood home in 1970 when he was nine years old. Unaware that bottle shows and bottle clubs even existed, he spent many hours at the local library learning as much as he could about his treasures. 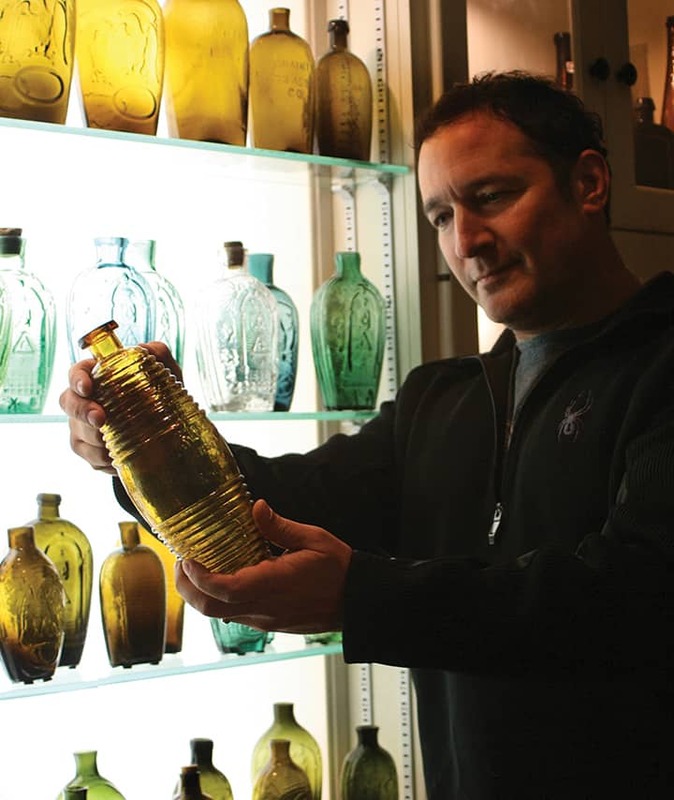 His interest waned in his teen years as other teenage pursuits took precedence, but Mark’s passion for bottle collecting was reignited while on a business trip in the late 1980s when he admired a small collection of historical flasks, Saratoga mineral waters, and other early bottles decorated the fireplace mantle of a restaurant. Since that time, Mark became very active in collecting and has focused his collecting on early Central New York bottles such as pontiled medicines, Saratoga’s and pontiled sodas. In 2008, Mark met Brian Wolff, another central New York collector and friend who shared an interest in the nearby Mount Vernon Glass Company. Mark has since focused his research and collecting interests on learning as much as possible and digging at the glassworks site. Together with Brian and Rich Strunk, many new and exciting discoveries have been made regarding this early, historic and relatively unknown glasswork. Mark is currently vice president, librarian and newsletter editor of the Empire State Bottle Collector’s Association, a Federation of Antique Bottle Collectors member and a lifetime member of the Saratoga-type Mineral Water Bottle Collectors. He has lectured many times and authored numerous articles on Central New York bottles, privy digging and other collecting topics. Rich Strunk grew up in the Capital District area of New York State. While on a family trip in 1969, they passed many roadside tables of bottles for sale. Mom said to check out the dumps in the woods, which produced several decent specimens. The bottle interest morphed into a business selling and restoring antiques of all types, which paid for college. 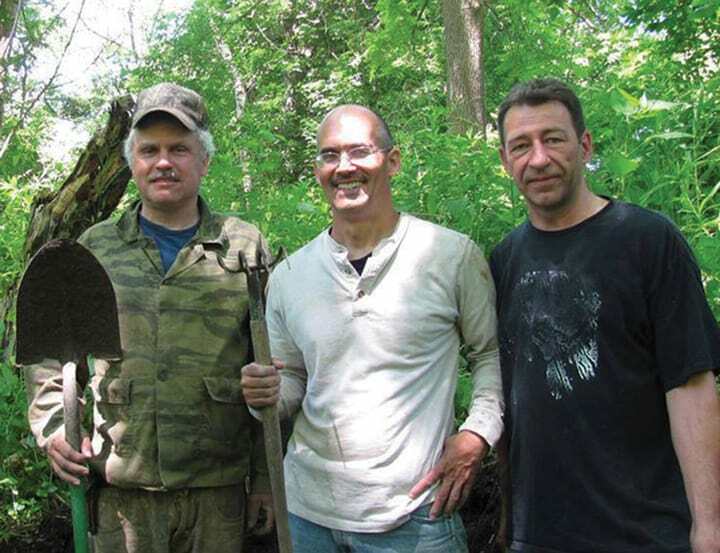 He got his BA in anthropology and worked as a professional archeologist for seven years. Then he was a full time antique dealer while taking courses on historic building techniques. In 1996, he founded Windy Hill Restorations, which specializes in historic building restoration. In 1975, he dug a pieces of a rare Saratoga bottle, from that find he joined the ranks of Saratoga bottle collectors. 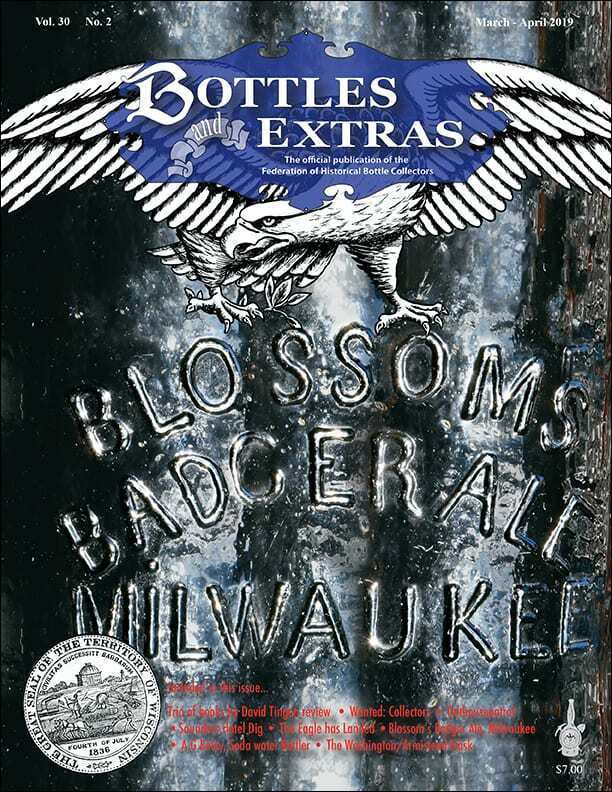 In 1977, he started researching the Mt Pleasant Glassworks, the source of many of these bottles. Rich currently lives in the Mohawk Valley area with his wife Lori. A few years ago, Mark introduced him to Brian Wolff who was researching the Mt. Vernon Glassworks, the predecessor of Mt Pleasant. He and Mark are currently professionally excavating a factory building and furnace and obtaining quantities of glass so we can start making valid conclusions about their output.